Congressional Republicans have marketed their most recent tax plan, the “Tax Cuts and Jobs Act,” as a boon for American workers and a tax cut for the middle class. 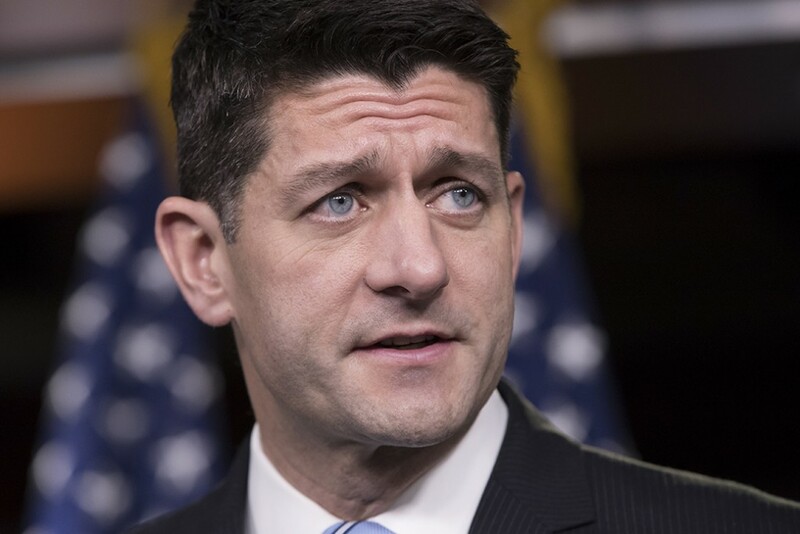 But the plan is heavily skewed to benefit the wealthy and corporations, including cutting the corporate tax rate from 35 percent to 20 percent at a cost of more than $1.4 trillion over 10 years; repealing the alternative minimum tax on high-income individuals at a cost of $696 billion; repealing the tax on estates worth more than $5.5 million at a cost of $151 billion; and creating a special new loophole that overwhelmingly benefits wealthy owners of passthrough business entities, such as limited liability companies and partnerships, at a cost of hundreds of billions of dollars. In reality, the House majority plan is not a good deal for middle-class and working Americans. It fails to cover the full cost of the tax cuts for the wealthy and corporations, adding to the deficit and putting middle-class priorities such as Medicare, Medicaid, education, and infrastructure at risk. In fact, if this plan were to pass, Medicare would face an automatic $25 billion cut next year. While the plan increases the standard deduction and provides a modest increase in the Child Tax Credit, overall tax benefits erode over time because the plan calls for slower inflationary adjustments. More importantly, under the guise of “simplification,” the plan takes away a range of tax benefits that are important to middle-income and working Americans, such as personal and dependent exemptions; the deduction for high medical expenses that arise from hardships such as a catastrophic diagnosis or a loved one entering a nursing home; the student loan interest deduction that benefits millions who are just entering the workforce after obtaining an education; and the deduction for state and local sales and income taxes. For some families, the loss of these important tax provisions outweighs any benefit from the standard deduction and the Child Tax Credit. In fact, the Tax Policy Center found that 36 million middle-class and working families nationally would experience a tax increase under the House tax plan by 2027. Simulations by the Institute on Taxation and Economic Policy (ITEP) provide a glimpse of how many families in each state would pay more in taxes under the House majority plan once it is fully phased in. Here, we present the number of families by state in the bottom 80 percent of that state’s income distribution—those with incomes below $95,270 to $206,160, varying by state—that would receive tax increases, based on ITEP’s simulations. The number varies from state to state in part due to differences in population across states. Many states would see tens of thousands of families with tax increases, while nearly three-quarters of U.S. states would see hundreds of thousands—and in a few cases well more than 1 million—families with tax increases under the plan. Alexandra Thornton is the senior director of Tax Policy for Economic Policy at the Center for American Progress. Andrew Schwartz is a policy analyst of Economic Policy at the Center. 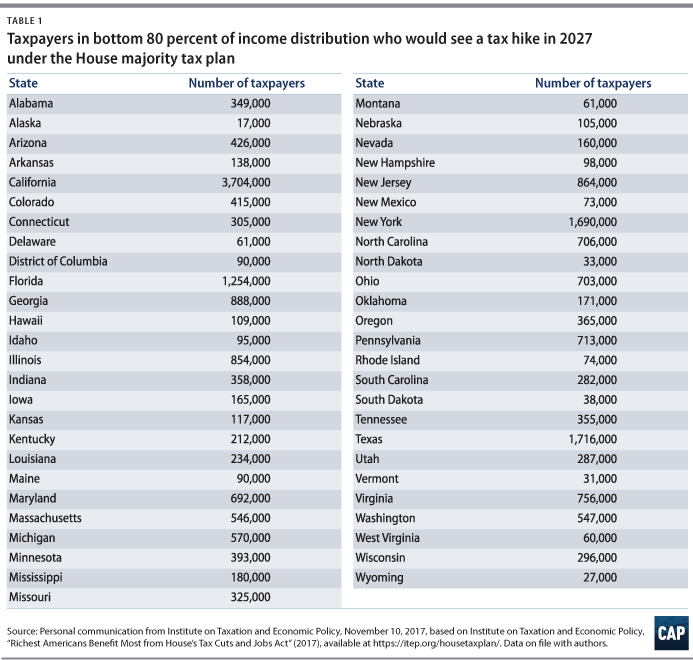 The analysis is based on data produced by the Institute on Taxation and Economic Policy in its report “Richest Americans Benefit Most from House’s Tax Cuts and Jobs Act.” The report online provides state-by-state data on the impact of the House tax plan in 2018 and 2027. The analysis uses a supplement to the 2027 data provided to CAP by ITEP. The data are broken down by income quintiles by state, up to the fourth quintile, with more detailed results shown for the 80 percent to 95 percent income group, the 95 percent to 99 percent income group, and the richest 1 percent. The CAP analysis includes the number of filers in the bottom 80 percent who face a tax increase in 2027. Since ITEP’s analysis is not identical to the Tax Policy Center’s results and is based on relative income groups in each state, not a national income threshold, these state-by-state numbers do not sum in total to the 36 million families who would see tax increases nationwide shown by Tax Policy Center data.